“A thoroughly researched and compelling mix of personal narrative and hard-nosed reporting that captures just how flawed care at the end of life has become” (Abraham Verghese, The New York Times Book Review). This bestselling memoir—hailed a “triumph” by The New York Times—ponders the “Good Death” and the forces within medicine that stand in its way. Award-winning journalist Katy Butler was living thousands of miles from her aging parents when the call came: her beloved seventy-nine-year-old father had suffered a crippling stroke. Katy and her mother joined the more than 28 million Americans who are shepherding loved ones through their final declines. When doctors refused to disable the pacemaker, condemning her father to a lingering death, Butler set out to understand why. Her quest had barely begun when her mother, faced with her own grave illness, rebelled against her doctors, refused open-heart surgery, and met death the old-fashioned way: head-on. Part memoir, part medical history, and part spiritual guide, Knocking on Heaven’s Door is a map through the labyrinth of a broken medical system. Technological medicine, obsessed with maximum longevity, is creating more suffering than it prevents. Butler chronicles the rise of Slow Medicine, a movement bent on reclaiming the “Good Deaths” our ancestors prized. In families, hospitals, and the public sphere, this visionary memoir is inspiring the difficult conversations we must have to light the path to a better way of death. “A lyrical meditation written with extraordinary beauty and sensitivity” (San Francisco Chronicle). Katy Butler’s articles have appeared in The New York Times Magazine, The Best American Science Writing, and The Best American Essays. A finalist for a National Magazine Award, she lives in Northern California. She is the author of Knocking on Heaven’s Door and The Art of Dying Well. “Knocking on Heaven’s Door is a thoroughly researched and compelling mix of personal narrative and hard-nosed reporting that captures just how flawed care at the end of life has become." “This is a book so honest, so insightful and so achingly beautiful that its poetic essence transcends even the anguished story that it tells. Katy Butler’s perceptive intellect has probed deeply, and seen into the many troubling aspects of our nation’s inability to deal with the reality of dying in the 21st century: emotional, spiritual, medical, financial, social, historical and even political. And yet, though such valuable insights are presented with a journalist’s clear eye, they are so skillfully woven into the narrative of her beloved parents’ deaths that every sentence seems to come from the very wellspring of the human spirit that is in her." “This is some of the most important material I have read in years, and so beautifully written. It is riveting, and even with parents long gone, I found it very hard to put down. ... I am deeply grateful for its truth, wisdom, and gorgeous stories—some heartbreaking, some life-giving, some both at the same time. Butler is an amazing and generous writer. This book will change you, and, I hope, our society." "Shimmer[s] with grace, lucid intelligence, and solace." "[An] unflinching look at America's tendency to overtreat [that] makes a strong case for the 'slow medicine' movement, which recognizes that 'dying can be postponed, but aging cannot be cured.'" "[A] deeply felt book...[Butler] is both thoughtful and passionate about the hard questions she raises — questions that most of us will at some point have to consider. Given our rapidly aging population, the timing of this tough and important book could not be better." "This braid of a book...examines the battle between death and the imperatives of modern medicine. Impeccably reported, Knocking on Heaven's Door grapples with how we need to protect our loved ones and ourselves." "A forthright memoir on illness and investigation of how to improve end-of-life scenarios. With candidness and reverence, Butler examines one of the most challenging questions a child may face: how to let a parent die with dignity and integrity. Honest and compassionate..."
"This is the most important book you and I can read. It is not just about dying, it is about life, our political and medical system, and how to face and address the profound ethical and personal issues that we encounter as we care for those facing dying and death. [This book's] tenderness, beauty, and heart-breaking honesty matches the stunning data on dying in the West. A splendid and compassionate endeavor." "This beautifully written and well researched book will take you deep into the unexplored heart of aging and medical care in America today. With courage, unrelenting honesty, and deepest compassion, ... Knocking on Heaven’s Door makes it clear that until care of the soul, families, and communities become central to our medical approaches, true quality of care for elders will not be achieved." 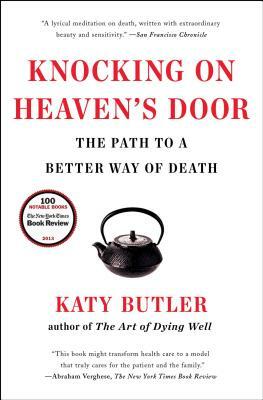 "Butler’s advice is neither formulaic nor derived from pamphlets...[it] is useful, and her challenge of our culture of denial about death necessary...Knocking on Heaven’s Door [is] a book those caring for dying parents will want to read and reread. [It] will help those many of us who have tended or will tend dying parents to accept the beauty of our imperfect caregiving." "Knocking on Heaven's Door is more than just a guide to dying, or a personal story of a difficult death: It is a lyrical meditation on death written with extraordinary beauty and sensitivity." "[Knocking on Heaven's Door is] a triumph, distinguished by the beauty of Ms. Butler's prose and her saber-sharp indictment of certain medical habits. [Butler offers an] articulate challenge to the medical profession: to reconsider its reflexive postponement of death long after lifesaving acts cease to be anything but pure brutality." "A stunning book, truthful and its dignified, and it could be a conversation-starter. If there's a need for that in your family -- or if you only want to know what could await you -- then read Knocking on Heaven's Door. You won't regret it."